Here's to an Amazing 2014 for HIV-Affected Families! It's the end of 2014, and I can't end this year without thanking you for an amazing year. It started with promise that this article I'd written--that I'd fought for and pursued for years--would finally be seen by the public. Then there was the name change (from HIV and Baby Makes Three to Positively Negative), some behind-the-scenes stressors and then--voila! In July, the book was suddenly available. The response from you all was fantastic. So far, the book has sold about 50 copies to people in the U.S., Canada, the UK, and Australia--not bad for a self-published title without the power of a publishing house behind it! To celebrate, I thought I'd share my top 12 moments of the year with you. (Twelve, because 10 cannot possibly contain the wonder this year brought.) Here we go. When I showed up to a pop-up exhibit of photography by HIV-affected families from San Francisco General Hospital, I did not expect for Shannon Weber, whom I quote in the book and who first introduced me to Poppy, to announce to the assembled crowd that she likes to "cape" people who are doing good work with HIV. Then she said things that were so kind toward me and Positively Negative that I've mostly blocked them out. But suffice to say, I took the cape and the compliments with gratitude. I'm honored. Thank you, Shannon. That's an image above of me doing a reading of the Epilogue for the assembled crowd, cape and all. Here's Shannon'sHall of Gratitude for the caped, and her entry for me. It's a special (and, not gonna lie, nerve-wracking) experience standing in front of a room of people and reading the words that have, so far, only been sounded out in my head or in the privacy of my home office. So when I got a chance to read for the people at the photography pop-up, and then, after the book's publication, at Shannon Weber's house, it was scary. But also amazing. I'm just sorry you guys didn't get to all be there. In Shannon's lovely San Francisco apartment, prominent researchers (UCSF's Bob Grant, lead investigator of the ground-breaking iPrEx study), Poppy, Caroline, folks from the larger San Francisco HIV community, and my own friends and colleagues all gathered. I did a reading of pieces of it, but the most powerful moments came when Caroline, Shannon and Poppy read the parts of the story that were most poignant to them. When Poppy passed around the birth announcement for her daughter, and then started crying when reading the section about her positive pregnancy test, it moved the whole room. It was moving beyond what I can say. Just before the book was published, Caroline, Shannon and I got the great idea to create a Positively Negative AIDS Walk Team. Yes, this is self-promotion, but it turned in to a good cause, too. 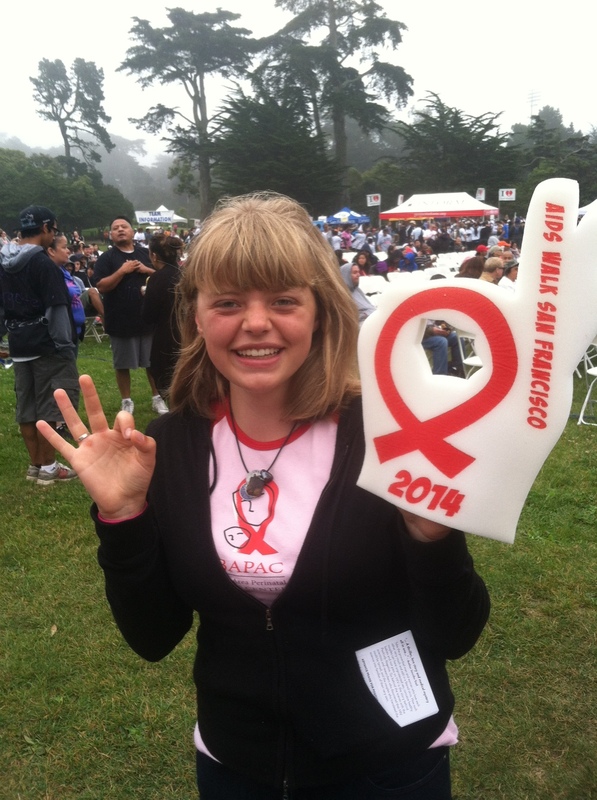 It turned out, when Caroline talked to the AIDS Walk staff, she was able to get theUCSF Bay Area Perinatal AIDS Center (BAPAC) assigned as one of the benefiting organizations. And because of that, some of the money raised by the walk (and by us!) went back to giving HIV-affected family access to all the parenthood options available to them. Plus, Caroline got to represent BAPAC (and HIV-affected families everywhere) by speaking at the beginning of the walk. I'll admit--I am not in good enough shape for all this. But we had a fantastic time. Shannon's daughter Taft was a champ, handing out Positively Negative postcards to all the families around us. Check us out: Me mugging with the Sisters of Perpetual Indulgence, and Taft giving the foggy, cold moring the A-OK. There may also be video of us dancing around as we warmed up before the walk, which I could be convinced to share if you ask nicely. When a book is published, it goes out into the void and, as an author, you never know if it's landing. That's why the amazing reviews the book has received, both from readers and bloggers, have been so heartening to me. "To me, though, the real lesson here is that public health and medical establishments move slowly, and people’s whole lives can be spent struggling in the gap between innovation and implementation. As a society, when it came to HIV and childbearing, we did not let couples make their own decisions and take their own risks. We did not really take infertility seriously, as a potentially devastating condition. We made it impossible for couples to decide that a small risk of HIV transmission was worth the possibility of building a family together. And we left those couples dangling for almost two decades, too long for many of them to ever bear children. In the future, will we do better in recognizing fertility and reproductive decision-making as a critical element ofreproductive justice? Might we find a way to accommodate individuals’ thoughtful decisions about risk-taking, rather than making their decisions for them?" And just recently, the Adoption Blog at Psychology Today featured a Q&A with me, allowing me to explore something I don't explore much in the book: adoption options for HIV-affected couples. Nurse-turned-health journalist Marijke Durning not only reviewed the book, calling it "well written, well researched and worth your time." And she asked to do a Q&A with me about the role of HIV (the idea of it vs. the reality) as a character in the book, and who I thought would benefit most from the book. The book also got a positive nod from the My PrEP Experience blog. Flattering? You betcha. But it's more important for the sake of the couples who will be helped by the news getting out there. That's the point of all this. The more people who hear about the book, the more likely it is to reach the people who need it. Darcy also emailed me directly to let me know that she bought the book for all her friends and family for Christmas. (And yes, this is a friendly reminder that the book is available for just $1.99 in Kindle, PDF and iBooks format on my website--less than the $2.99 cost at Amazon.) And if you were moved by the book, it's not too late for you to leave a review on the Amazon page, either. The more reviews, the more likely people are to discover the book! This became a great opportunity to promote Positively Negative through news stories that drew the attention of the people who might need the technology most. First, I did a story on how Truvada offers the first woman-controlled HIV prevention option, for BETABlog, the publication of the San Francisco AIDS Foundation. Then I did a story for The Star-Ledger in New Jersey, in which I got to talk to exactly the kind of woman who needs HIV protection the most: A straight, African American woman, dating in a community with an extremely high level of uncontrolled and undiagnosed HIV, who found out her longtime boyfriend was positive. Her sister had died of complications to AIDS. She knew what a grisly death it could be. It really pointed out a huge blind spot in the book--the fact that both couples in it are white. More and more, HIV is a Southern, African American epidemic. As I work on updating the book, I'm going to work to incorporate a more balanced view into it. And then there was the story I wrote for The Daily Beast on women and HIV prevention (which was then referred to in a story on the same topic on TakePart). The word is getting out there! When I wrote Positively Negative, I didn't think of it as only or even primarily about Truvada and pre-exposure prophylaxis (PrEP). To me, the book and this moment is about choices and options. In fact, what I came to believe during the reporting and writing process was that PrEP is not necessary for many couples like the Hartmanns and even the Morgans--couples where the HIV-positive partner's viral load is fully suppressed. However, that's the moment we're in, as people get their mind around another option besides condoms. So I was delighted to get to write for BETAblog about some new research that continues to show that women who take Truvada for PrEP (as opposed to HIV-positive women who have been taking Truvada during pregnancy for years) are no more likely to see birth defects in their babies than women who don't. The science is nascent on women who don't have the virus, but it's exciting to see the science roll in. I'll be monitoring this and adding this to Positively Negative as the news evolves. The best part of the crowdfunding campaign, by far, was connecting with you guys--the readers, the advocates and the people for whom this issue is close to your heart. So I was moved when one of you gave $200 for the chance to speak to me on the phone. I won't go into the details of the call, because I told the caller I wouldn't. But suffice to say that through that call I discovered what a lifeline Positively Negative could be for couples who are isolated, getting contradictory or even stigmatizing advice from their healthcare providers, and don't know where else to turn. You are who I wrote this book for. I'm so glad I got to talk to you. I have to include this in the list of highs from this year because it's a professional high for me, and without Positively Negative I never would have gotten to do it. In addition to adding "Author" to my title, this year, I got to add The Washington Post to my credentials. In support of the book, I pitched a story to the editor there about how local governments were stepping up to turn PrEP from a policy to an accessible option. The story itself featured an African American man, not a woman, but it was a moving piece for me, especially the trust Nick, the man I featured, placed in me. The story got some flack from activists for the headline. If only they'd added "yet" to the end of the headline--"The World's Most Effective HIV Prevention Drug Hasn't Lived Up to Its Potential, Yet"--I think it would have been more accurate. When I started this story, I knew the Hartmanns had been interviewed before. After all, that's how I met them--I interviewed them for a story on parenthood options for HIV-affected families. But when I started what turned in to Positively Negative, I had no idea how their stories would resonate outside the book. This year has seen a story featuring the Hartmanns' condomless conception in the Washington Post (sadly, not written by me!) and a segment by CNN's Sanjay Gupta. The Morgans, meanwhile, really went with the pseudonym I chose for them, and allowed themselves to be filmed (I'm so proud of them!) for a Dutch film crew (I spoke to the reporter, and he told me they are considered the Dutch 60 Minutes). And just this week, an interview they did with Fusion went live. I've always said this is their story, not mine. I just hope that they feel I've done their story justice. 2. Positively Negative Excerpted on The Atlantic! This is where it all started. In the Fall of 2012, I got an assignment from The Atlantic's Health channel to write about pregnancy for HIV-affected couples. That spiraled into a 9,000 (then 10,000)-word article that was too long for their pages. After much thought and focus, I decided that, rather than cut the piece from 9,000 words to 6,000 words, I would publish it myself. And so it was gratifying when I approached The Atlantic about running an excerpt and they whole-heartedly agreed. The excerpt, Getting Pregnant When One Partner Has HIV, tells just a piece of Poppy and Ted's story. I hope it whets people's appetites for the full story. For me, it's a professional honor. Maybe this seems anticlimactic after everything I've listed, but I'm here to tell you that this is the biggest deal of all. When I was raising funds for the book, I set Valentine's Day as the release date for the book, at least in my head. How hard could it be? I thought. I'd already done the heavy lifting. The draft was done, and I loved it. But Valentine's Day turned in to March 10 for National Women and Girls HIV/AIDS Awareness Day, and then I stopped setting deadlines. The hard work of editing, and then fact-checking were, in fact, work. Figuring out the format and contemplating images and hiring graphic designers and other professionals on my own dime followed. There were dark nights of the soul in there. I often wondered if I'd made a mistake. Publishing with The Atlantic certainly would have been easier, though I don't believe it would have served the story nearly as well. When I finally told my colleague and consultant Damon Brown that I was ready to publish, he congratulated me. "Most people don't ever do this," he told me. "You should be really, really proud." And you know? I am. I am enormously proud of this piece of journalism and the courage and generosity of all my sources. It shouldn't take courage to talk about wanting to have a child, but the fact that it does shows how far we still have to go to bring the culture up to date with the science. I am hopeful we will get there, and I hope Positively Negative contributes to steps in that direction. So I end this (very long) recap with a tremendous bow of gratitude. I literally could not have done this without you. I wish you a peaceful holiday season--and where that's not possible, I wish you acceptance and compassion for yourself and others. I wish you a beautiful 2015. And stay tuned: The new year promised an expansion of the book, more articles, a panel on the new era of HIV for the Association of Health Care Journalists (organized and moderated by yours truly), and perhaps even a few awards. Wishing you and yours love.